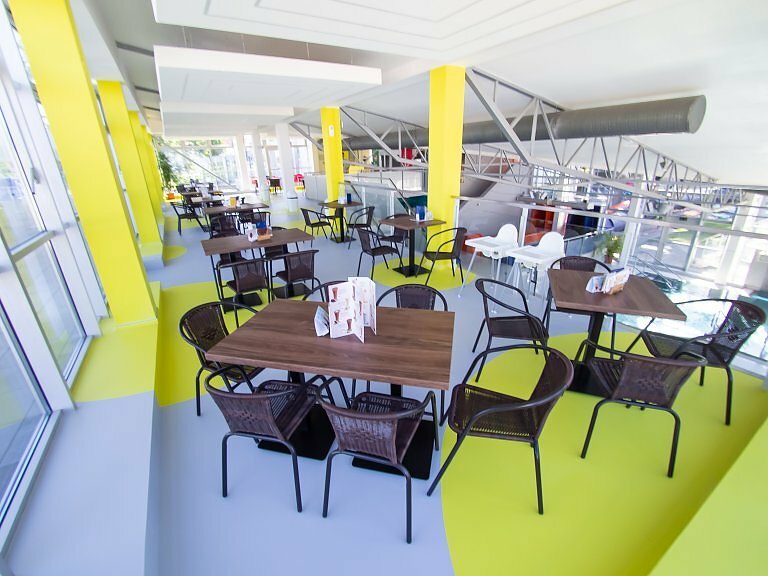 Stylish coffee bar situated on the first floor offers nice view over aqua park surrounding. You may choose from wide offer of alcoholic and non alcoholic drinks, premium coffee and tea, and original cocktails. Families with children have at their disposal play area. Enjoy your favourite drink undisturbed with splendid view. Food facility with fast and tasty assortment of dishes. We offer various soups, main dishes, fried, grilled, salty and sweet meals, draught beer, great coffee, and in the summer a vitamin bomb – exquisite fresh salad. Large bar situated between the pools in relaxing zone of the SPA allows you to comfortably rest with direct view to pools. The bar offers a wide range of alcoholic and non alcoholic drinks, various types of hot and cold drinks, delicious taste of several hot chocolate flavours. Outdoor bar on the island (open during summer season) surrounded by calming river bickering makes pleasant visit to any visitor. Enjoy yourself excellent food and tasteful drinks directly on the island.There is a volleyball ground and playground for your children close to the bar.